Broadway shows are finally back in New Orleans for the first time since Hurricane Katrina four years ago. Broadway shows are finally back in New Orleans for the first time since Hurricane Katrina four years ago, and at least one — "The Color Purple" — is giving something back to the recovering city. "The Color Purple" opens at the Mahalia Jackson Theater on Tuesday, but for months leading up to its New Orleans stop, the show has been raising money in cities across the country to help families displaced by Katrina. "We all felt a very strong emotional and spiritual connection to the city and the people," said Scott Sanders, the show's lead producer. "We thought, we can't just sell tickets and leave. We have to do something special while we're there. We have to leave something behind." "The Color Purple" is only the second major Broadway production to come to New Orleans since Katrina flooded 80 percent of the city in 2005. The first was "Cats," which ran Oct. 27-Nov. 1 at the Mahalia Jackson Theater. The Mahalia Jackson is the city's only major performing arts theater to reopen since the storm. Others, including the Saenger Theatre, State Palace Theater and Orpheum Theater, are still under repair or have not yet begun renovations. David Skinner, general manager of the Mahalia Jackson, said reviving the performing arts in New Orleans has "been a real uphill struggle." The 2,100-seat theater flooded and had wind damage requiring millions of dollars in repairs. It reopened in January. "It's been tremendous, the opera, the ballet, and now bringing Broadway back," Skinner said. "It's been very exciting." Sanders said "The Color Purple" — which opened in New York in December 2005 — was honored to be asked to be a part of the first post-Katrina Broadway season in New Orleans. The season also includes "Mamma Mia" in February, "Wicked" in March and "Avenue Q" in June. "The Color Purple" donation drive netted more than $300,000 from cities across the country, including Chicago, Atlanta, Cincinnati, Birmingham, Ala., Orlando, Fla., and Norfolk, Va. It will put at least 20 families back in their homes. Cast and crew are slated to meet with the 20 families after Tuesday's performance, and on Wednesday, they will help move Violet resident Lynette Harvey and her family into their rebuilt home. "There's not enough words to describe how grateful I am," said Harvey, 44, whose home was flooded to the roofline. "I'm just so happy. I feel so blessed because there were times I thought I'd never get back home." "The Color Purple" is working with the St. Bernard Project to help Harvey and the other families. The nonprofit agency works with families in Orleans and St. Bernard parishes to rebuild their Katrina-damaged homes. Zack Rosenburg, director and co-founder of the St. Bernard Project, said it takes an average of $15,000 in materials and hundreds of volunteer hours to rebuild one home. He said "The Color Purple" has provided a much-needed morale boost for the city and its residents. "It has shown the people here that their citizenship and humanity matter," Rosenburg said. "So much of the federal response, while well-intentioned, was incredibly late. So much has been driven around failure, what went wrong and who is to blame. The needs here are incredible." To date, the St. Bernard Project has rebuilt just under 250 homes in New Orleans and St. Bernard Parish and is currently working on dozens more. More than 17,000 volunteers have worked with the organization since its launch after hurricanes Katrina and Rita. Rosenburg said the fact that "The Color Purple" is the show giving the donations has had an impact on the residents. He said the people of New Orleans can relate because "The Color Purple" is an inspiring story about a woman who, through love, finds the strength to triumph over adversity. "It has a focus on family, resilience, strength and home," Rosenburg said, saying those are "themes that, now more than ever, appear to be universal." Harvey said she's been a huge fan of both the Pulitzer Prize-winning novel by Alice Walker and the film by Steven Spielberg and is looking forward to seeing the Broadway show Tuesday. Harvey and other families have been invited to opening night, she said. 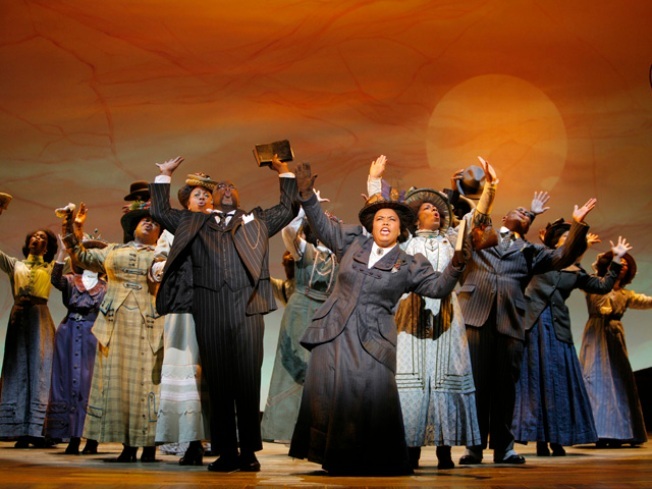 "The Color Purple" was nominated for 11 Tony Awards, including Best Musical. The show's national tour began in May 2007 in Chicago and continues through 2010. It will be in New Orleans through Sunday.